Toronto residents will soon head to the polls to elect a new mayor and city council. 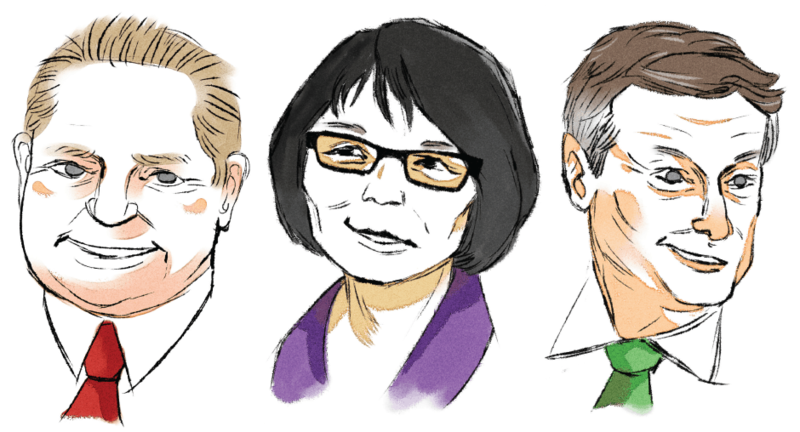 Of the 60 prospective candidates, Olivia Chow, Doug Ford, and John Tory are the lead contenders for the city’s top job. Ford entered the mayoral race on September 12 after his brother, incumbent mayor Rob Ford, was diagnosed with malignant liposarcoma. The Varsity spoke with Olivia Chow and John Tory to get their perspective on student-related issues, including transit, youth unemployment, and affordable housing. Doug Ford did not respond to numerous requests for comment. John Tory, a former member of provincial parliament and head of the Ontario Progressive Conservative party from 2004 to 2009, previously ran for mayor of Toronto in 2003 and lost the race to David Miller in a close election. Tory’s private sector experience includes time as a reporter, lawyer, broadcaster, and businessman. Tory noted that students are critically important to the city of Toronto. “These 300,000 post-secondary students are the future generators of cultural and economic life in this city,” he said. Tory also recognized the challenges young people face when looking for a job. “Youth unemployment is at an all-time high, and that’s a massive concern for students,” he said. Tory pledged to double the number of companies in the Partnership to Advance Youth Employment, a joint initiative between private sector employers and the City of Toronto, to create thousands of new jobs for young people and make it easier for them to connect with businesses. He also committed to coordinate and consolidate Toronto’s youth employment services. A Canadian Centre for Policy Alternatives report found that, in 2013, the unemployment rate for Ontario youth aged 15–24 ranged between 16–17.1 per cent. The national unemployment rate for youth aged 15–24 ranged between 13.5–14.5 per cent over the same time period. Olivia Chow served as a Toronto city councillor from 1991 to 2005, and New Democratic Party member of parliament for the Trinity-Spadina riding from 2006 to 2014. She resigned her seat last March in order to run for mayor. “Students are our current and future leaders,” said Chow. “They are community builders, who hold our future prosperity and quality of life in their hands. I know it’s a difficult market for jobs, and education is expensive,” she added. Chow emphasized the importance of promoting economic growth in the city. “We have a growing and vital environment for new business and investment. I will support this through revamping Enterprise Toronto to make it easier to find support, multi-lingual services, and mentorship,” she said. Chow promised to consolidate Toronto’s economic and non-governmental organizations, such as the Toronto Region Board of Trade and Toronto Financial Services Association, into one body. She also committed to hiring young people directly for certain city intiatives, such as tree-planting, and requiring companies with large city contracts to hire and train young people. Ford, a former city councillor, has released few details on his campaign platform, but said it will be similar to that of his brother. “Why do I want to be Mayor of Toronto? Simply put, I want to carry forward the agenda that Rob [Ford] and I started together,” Ford said in a fundraising email, as reported in the Toronto Sun. Ford’s campaign platform centres on keeping taxes low and cutting red tape. He also committed to investing $30 million a year in Toronto Transit Commission (TTC) service improvements, building the Yonge Relief Line, and completing the Sheppard subway line. Besides housing, some students also cited transit and bicycles lanes as two of the most crucial election issues. The TTC is the third largest transit system in North America, after Mexico City and New York City, with 10,132 service stops served by vehicles in the Greater Toronto Area. TTC ridership has increased yearly for the past decade. “Residents in this city note that many cities — ones far bigger and more populated than Toronto — have more efficient transit models and wonder why Toronto can’t get with it,” said Aliya Bhatia, a third-year international relations student who has volunteered for the Olivia Chow campaign. Luis Lopez, a second-year political science and economics student, agreed. “I use the TTC often, and I am constantly disappointed with the service. As a young person, the most valuable resource I have is time, and the TTC is making me lose that resource,” Lopez said. Mrinalini Dayal, a recent graduate, also called on mayoral candidates to expand PRESTO card service throughout the city’s transit network. PRESTO, an electronic fare payment system, is only available in 14 subway stations. Chow has outlined a number of transit plans that specifically address Toronto students. “I will invest in bus services to help get students to York [University] faster. I’ll invest in track signal renovations to make Line 1 run more efficiently for Ryerson [University], University of Toronto, and OCAD [University] students. And I am the only candidate with a plan to provide a dedicated above-ground rail stop for the 12,000 full-time and 28,000 part-time students at Centennial College,” Chow said. Chow also hopes to streamline the process for obtaining a student TTC pass. “I will give campuses the ability to sell all fare media and print TTC Post-Secondary Student IDs. Rather than having to go to Sherbourne station, you’ll be able to get your ID on campus,” she said. Chow has also promised to expand Toronto’s cycling infrastructure, planning to build 200 kilometres of new bike lanes across the city. “Whether by foot, by car, by transit, or by bike — I support making it easier for you to get where you want to,” Chow stated. Tory echoed the importance of bicycle lane expansion. “Toronto’s cycling infrastructure needs a boost. The number of cyclists in the city has grown, but infrastructure has not kept pace,” he said. Tory’s expansion plan consists of a network of separated bike lanes in the city. “I support the Adelaide and Richmond pilot project to get a better understanding of how additional bike lanes changes [sic] to the flow of traffic,” Tory added. Many of Toronto’s post-secondary institutions are located downtown, which Tory said poses a problem to students who have to balance affordable living with accessibility to their place of study. “SmartTrack will connect Toronto’s many surrounding areas to the city’s center, thereby making our city more functional and affordable for students,” Tory said of his transit plan. According to Tory, his SmartTrack transit plan is a surface subway that utilizes existing GO Transit tracks. It includes 22 stations, spans 53 kilometers, and is designed to be completed in seven years. “SmartTrack will be built on 90 per cent existing track, and provide all day, two-way, rapid-transit service across the city, not just the downtown, ” he said. Basil Southey, a first-year student, also called on candidates to address the issue of affordable housing. Covenant House, Canada’s largest homeless youth agency, estimates that there are at least 10,000 homeless youth in Toronto during any given year. Estimates also peg the mortality rate of homeless youth at up to 40 times the mortality rate of housed youth. “Transit and affordable housing are the two most important factors to look at to give youth a chance to live and work in Toronto,” Southey said. Emily Tsui, president of the Association of Political Science Students, expressed concern with the various transit promises of the candidates. “Even if the political will is there, funding concerns need to be further addressed in a more direct and realistic manner,” Tsui said. However, Tsui was optimistic about the impact the election could have on voter engagement in Toronto. “Rob Ford’s term in office has undoubtedly prompted political opinions from individuals who previously did not have one, and those who had not seen a reason to be involved with politics are now getting involved. If anything, I think there is hope that the voter turnout will increase, and new and upcoming voters will be excited from this election to continue their engagement with democracy,” she added. The municipal election is scheduled for October 27.